Aubeterre-sur-Dronne is in the south-east of the Charente department, and 20 kilometres west of Riberac (in the Dordogne department), on a meander in the Dronne river. The village is listed as one of the most beautiful villages in France. Poised on a steep hill above the Dronne River, Aubeterre is a very pretty village. The houses are in the local white stone, some with traditional first floor galleries, others with multi-levelled galleries, and many with attractive roofs. A large number of the houses have been carefully renovated. 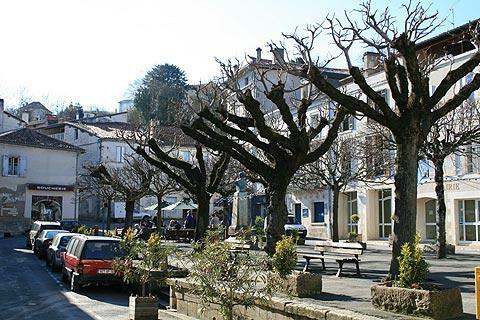 Start your visit in the 'lower town' and in the Place Trarieux and the streets around this square where you will find most of the shops and restaurants in Aubeterre-sur-Dronne. The big attraction in the village is the church of Saint-Jean, an extensive troglodyte church (also known as the monolithic church) dating in part to the 5th century and not far from the Place Trarieux. This monolithic church in Aubeterre-sur-Dronne was an important stop on the pilgrimage route to Compostella in the Middle Ages. The main body of the church is 20m high and is the tallest hewn-out church in the world. There is a full-immersion baptismal font carved out in this part and a reliquary which is claimed to have once housed a holy relic. It is possible to climb the steps up to the first floor from where you can really appreciate the height and size of the church. To the side of the main chamber is a burial area where 80 burial holes have been hewn out of the stone. Each with the head pointing to Jerusalem. A very eerie sight! The church of Saint-Jacques is another notable highlight on a visit to Aubeterre sur Dronne, especially for the quality of the stonework around the portail and facade of the church. In the highest part of the village you can also see the Clarisses convent and the Cordeliers and Minimes monasteries. For a small village there is a lot to see! After having a good look round there are bars and restaurants on the Place Travieux where you can stop and relax. France This Way comment: the architectural style of Aubeterre-sur-Dronne makes it an interesting 'transition' town between the different landscapes and architecture of the Charente and Dordogne regions, and a visit is recommended. Various leisure activities here are available along the river such as swimming in the river, fishing and canoeing. It is true that most of the towns, villages and attractions in this region are quite minor, such as the roman style churches in several of the villages, for example. The main market town near Aubeterre-sur-Dronne is at Riberac.